The page you are now reading describes how you can use Windows 2000/XP with Openswan. It assumes you are already familiar with setting up Openswan with L2TP/IPsec. If you are not, it's probably a good idea to start with reading this page (the first one in the list). It includes information on setting up the Linux side. The other pages contain specifics on several L2TP/IPsec clients which are available for Windows and Mac OS X. 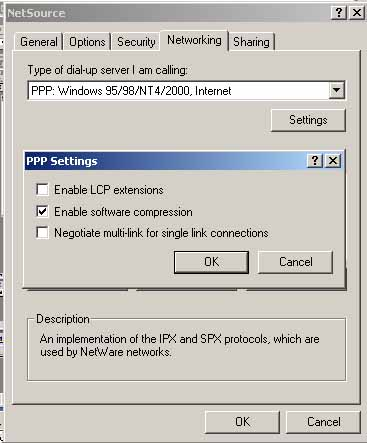 As mentioned on one of those webpages, Windows 2000/XP can be configured to use IPsec without L2TP. See Nate Carlson's webpage for that. This page, however, is about using IPsec with L2TP. There are basically two methods of authenticating Windows 2000/XP clients in IPsec VPNs: Preshared Keys (PSKs) and X.509 certificates. If you have at least one Windows XP client, I recommend that you start with a PSK and test it with that Windows XP client. It should be easier to do than setting up certificates. Once you got a basic setup working, you can proceed with certificates. On Windows 2000 clients, however, it is more difficult to configure a PSK. So if you only have Windows 2000 clients, I suggest that you skip PSKs altogether and use certificates. Note that if you want to use PSKs then either each client shares this single PSK (not recommended for security reasons!) or each client has its own PSK but is also required to have a fixed IP address. For testing purposes this should not be a problem. Fixed IP addresses are not required for clients which use certificates. Don't forget to disable the PSK configuration files once you switch to certificates! Openswan will get confused if there are PSK and certificate configuration files for the same client / IP address. The PSK configuration will get the upper hand. There is a snag, however. Microsoft believes that certificates should only be used for authenticating computers, not users (never mind that third-party clients such as SSH Sentinel and PGPNet authenticate users with certificates just fine!). 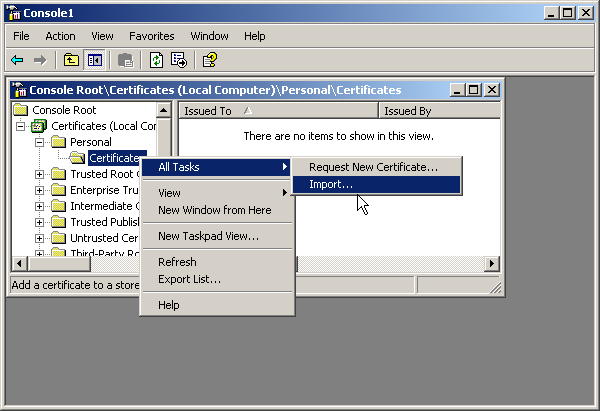 This means that the certificate of the user has to be imported as a 'local computer certificate' (requires Administrator privileges). The result is that the certificate is shared by all users on the client machine (if there is only one user this should not be a problem of course). You can use different usernames and PAP/CHAP passwords to distinguish the users on a client, but passwords provide weaker security than user certificates. One final remark: I believe it is not possible to store the 'local computer certificate' on a smartcard or USB token, unfortunately (please correct me if I am wrong!). You can import a certificate to Windows 2000/XP manually (through MMC) but it can also be automated. See the "Advanced" section for that. The author of this document is Jacco de Leeuw. Corrections, additions, extra information etc. are much appreciated. The L2TP/IPsec client is installed on Windows 2000 and XP by default. If you use an export version of Windows 2000, you will need to increase its encryption strength, otherwise Windows 2000 will try to use DES instead of 3DES. Single DES is not supported by Openswan because its strength is considered insufficient. So either install the Windows 2000 High Encryption Pack, or install Service Pack 2 or higher. Any version of Windows XP already supports 3DES. In case you previously used the Linsys IPsec Tool (lsipsectool) or Marcus Müller's IPSEC.EXE tool or some other third-party IPsec client, be advised that these clients disable the "automatic L2TP/IPsec policy" in Windows. 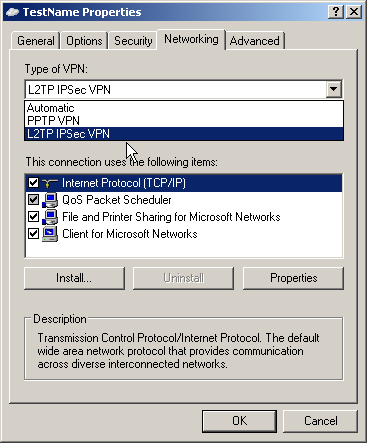 This policy sets up the proper IPsec rules when you "dial-up" an L2TP/IPsec VPN connection from Network Connections. To (re)enable the automatic L2TP/IPsec policy you need to remove the registry key HKLM\System\CurrentControlSet\Services\Rasman\Parameters\ProhibitIpSec or change the value of this key to 0. The L2TP/IPsec policy will then be enabled after you reboot Windows. Without the automatic L2TP/IPsec policy the VPN client will try to set up a pure L2TP connection, which is not protected by IPsec encryption. Microsoft Knowledge Base article Q310109 describes how the policy is disabled, but you need to do the reverse, i.e. enable it. If you use a Windows XP version pre-ServicePack 2 there may be a problem with its built-in firewall ("Internet Connection Firewall"). If you encounter this problem, you may have to open ports in ICF (probably UDP ports 500 and 4500), or disable it completely, or get another personal firewall such as ZoneAlarm or BlackICE. Jim Carter suggested the latter solution because he believes that there is in fact a bug in ICF. The new firewall in XP's ServicePack 2 is called "Windows Firewall" and it replaces ICF. Windows Firewall works fine with L2TP/IPsec. There is one issue that you have to keep in mind: the default settings block incoming "ping" requests (ICMP echo). This is a bit annoying if you are testing and troubleshooting connections. Fortunately, ping can be enabled (see Knowledge Base article Q320855). We will start with Preshared Keys (PSKs) under Windows XP. The routine for authenticating Windows 2000/XP through certificates is almost the same, so I recommend you read this section either way. 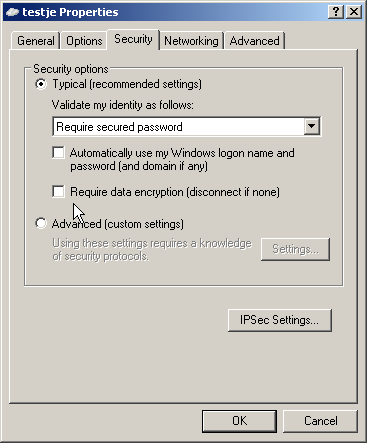 The IPsec client included with Windows XP supports PSKs out of the box. Windows 2000 does not (not easily, that is). You could add the PSK manually (requires changing the Windows 2000 registry) and then configure the IPsec policy by hand, but this is very complicated and error prone. So if you use Windows 2000 clients exclusively, you are probably better off with certificates. Or you could use IPsec without L2TP. If you decide to stick with L2TP/IPsec for Windows 2000, I suggest you read this part anyway, so that you get an idea of how things are configured. PSKs are easier to use than certificates but they have the disadvantage that in practice you can use them only for clients which have fixed IP addresses. Preferably, the PSK is distributed out-of-band, e.g. you write it down on a piece of paper and walk to the other machine. Here is the procedure for configuring a Preshared Key based L2TP/IPsec connection on Windows XP. Click on the links for Windows 2000 screenshots. (There are some small GUI differences with Windows XP. Alan Whinery has made screenshots for the various Windows XP styles). 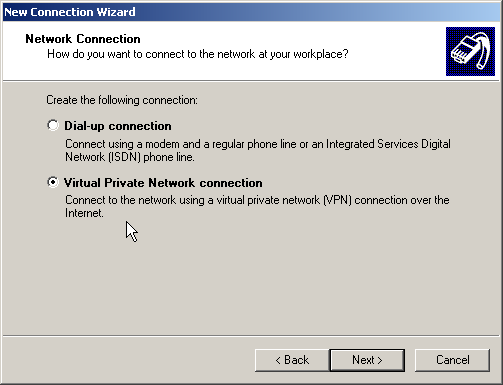 Select "Virtual Private Network connection". Enter a name for this connection. Enter the (external) IP address or hostname of your Linux server. Select either "do not dial" or "automatically dial" the initial connection. If you do not have a direct connection to the Internet, you may want to select your analog connection, ISDN, PPTP or PPPoE connection here. 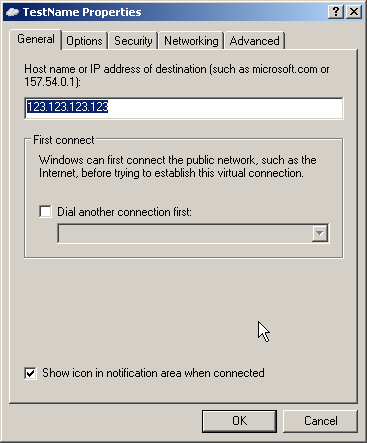 When you start the VPN connection Windows will then first dial your Internet connection. (Of course you can also choose "do not dial" and then manually start the Internet connection every time you want to use the VPN connection). A "Connect To..." window will pop up. Click "Properties". Verify the settings in the "General" tab. You entered these in the previous steps. Now select the "Options" tab. If there is a Windows or Samba domain server on the internal network that you would like to log on to, select "Include Windows logon domain". 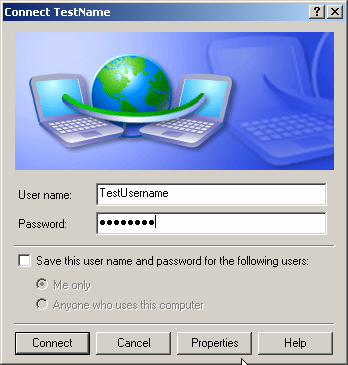 The client will prompt for the logon credentials if you select "Prompt for name and password etc.". Note: Windows XP Home cannot logon to a domain, so this option is probably not available in Home (not checked). Uncheck "Require data encryption". This is probably the easiest option but unfortunately it is also counterintuitive. Your users/customers might get the idea that this will make the VPN connection unsafe. This is of course not true: IPsec already does encryption. Or you could select "Advanced (custom settings)" and then add CHAP to the allowed protocols. Set data encryption to "Optional". Then click "OK". While still on the "Security" tab, click "IPsec Settings". 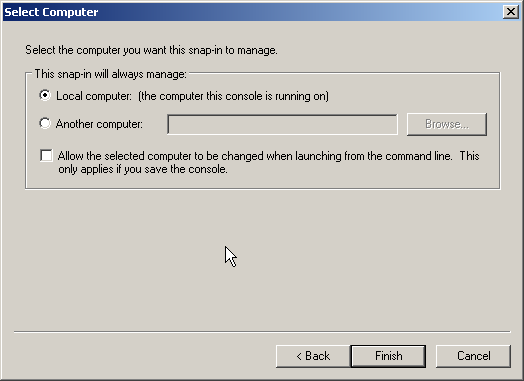 (If you don't see this button, you're using Windows 2000, which means you will have to skip this step and continue with the next one. You are also forced to use certificates since Windows 2000 does not support PSKs). 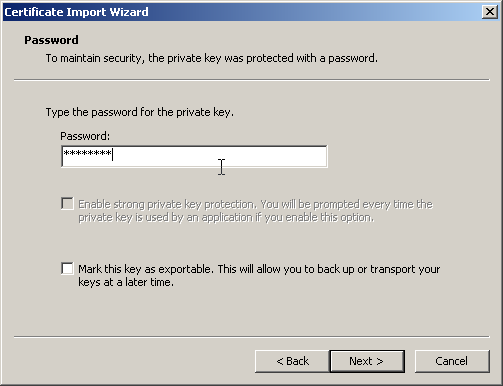 If you use Windows XP, enable the checkbox "Use pre-shared key for authentication". Enter the PSK for this user. This is the same PSK as entered in /etc/ipsec.secrets on the Linux server. Click "OK"
Select the "Networking" tab. Change the type of VPN to "L2TP IPSec VPN". Click "OK". The TCP/IP protocol should be listed. Other protocols such as NWLink and NetBIOS will not work. Select the "Advanced" tab. Optionally you may activate Windows XP's Internet Connection Firewall or enable Internet Connection Sharing, but I don't know if this works. Using ICS on a VPN connection may be a bit counterproductive, I guess. Click "OK". You're back at the "Connect To..." window. Enter the username and password (as entered in /etc/ppp/chap-secrets on the Linux server). On the Linux server you should successively get an IPsec connection, L2TP connection and then a PPP connection. Check /var/log/secure and /var/log/messages on the Linux server for errors. If everything works fine, you might want to consider upgrading to certificates. See below. At this point I assume you have made certificates for your users. If not, see my other webpage. In most cases certificates come in the form of PKCS#12 files. These files contain the user's certificate, the corresponding private key and one or more CA root certificates. There are two ways of importing certificates: manual and automated. If you want to do an automated import, you need to download and install a utility on the client (see below). Here is 's how you can do a manual import to Windows 2000 or XP. (For an automated import of the certificate, see below). Log on as Administrator (importing an IPsec machine certificate requires Administrator privileges). 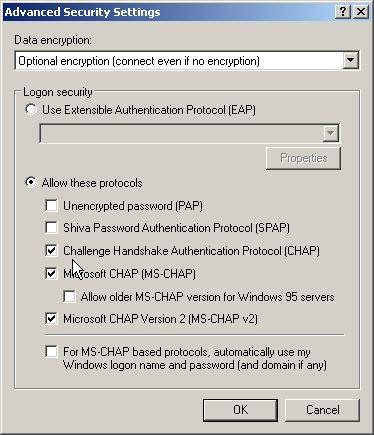 If you run an export version of Windows 2000 Professional, install the "High Encryption Pack" or SP2+. Click "Start" and then "Run". Enter "mmc" and click "OK". This will start the Microsoft Management Console. 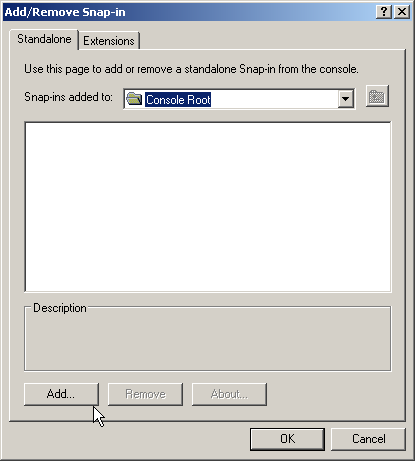 From the menu, select "File" and then "Add/Remove Snap-in". 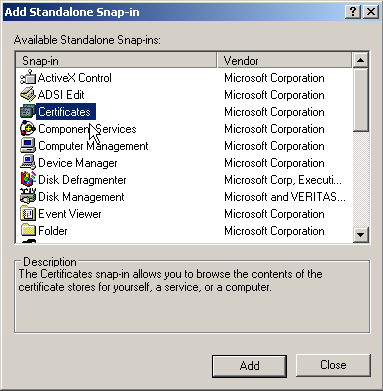 Select the "Certificates" snap-in. Click "Add". Once it is added, click "OK". Select "Computer account". That's because Microsoft thinks IPsec certificates can only identify computers, not people. You are about to add the "Certificates" snap-in. Click "OK". The "Certificates" snap-in has now been added. Expand the "Certificates (Local Computer)" tree. At the top you will find a folder called "Personal". Expand it as well. In the Personal folder, you will find a folder called "Certificates". Select it with the left mouse button and then open its context menu with the right mouse button. Select "All tasks" and then "Import". 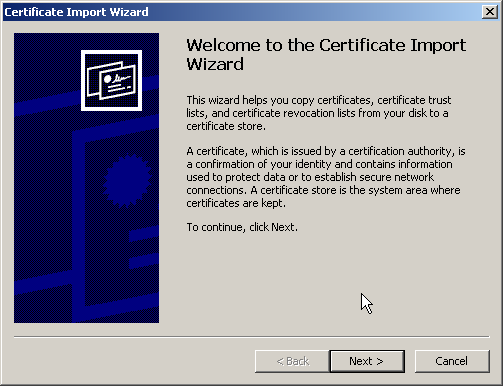 The Certificate Import Wizard starts. Click "Next". You will get the "File to import" dialog. Initially, the "File name" field will be empty. Click "Browse". Change "Files of type" to "Personal Information Exchange (*.pfx, *.p12)". Select the certificate file for this user. Click "Open". You return to the "File to import" dialog. Click "Next". Enter the password protecting this certificate file. 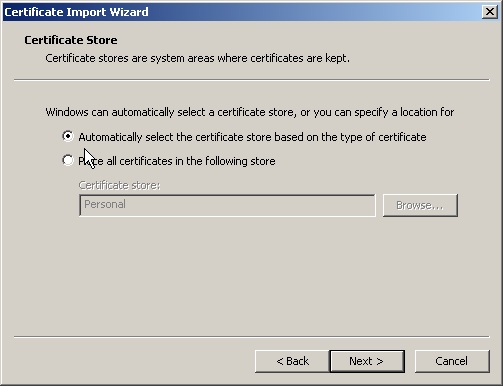 Select "Automatically select the certificate store". (Do not use "Place all certificates in the following store: Personal"). Click "Next". 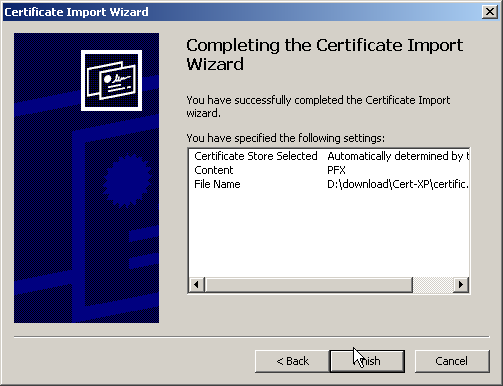 Complete the Certificate Import Wizard by clicking "Finish". At first, the certificate you just imported will not be present in the window. From the menu, select "Action" and then "Refresh". The imported certificate should now show up. 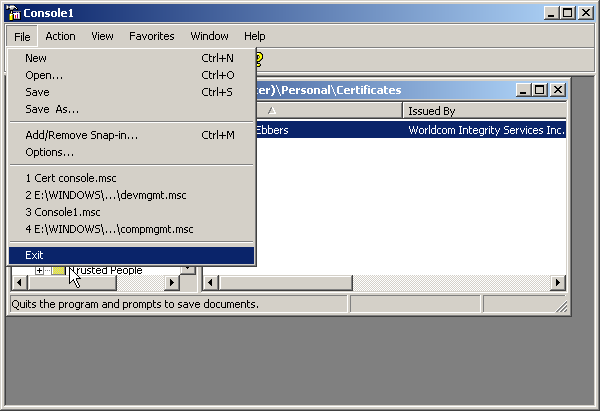 (Optional) If you want to verify that the installed personal certificate is usable, double click the certificate. You should see: "You have a private key that corresponds to this certificate". 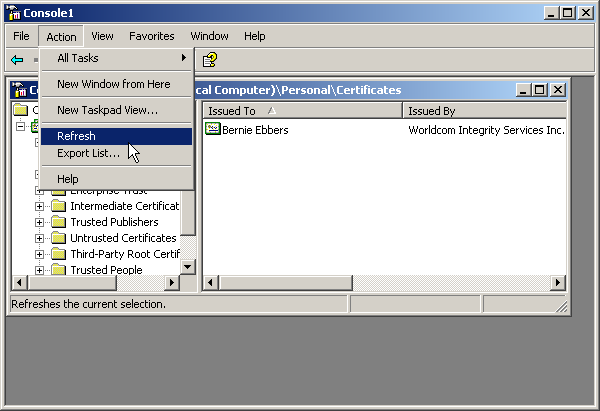 "Certificate Information" should display the purposes of the certificate *). If it does not, and the certification path does not chain to a valid root certificate, the error "Windows does not have enough information to verify this certificate" is displayed. From the menu, select "File" and then "Exit". MMC asks if you would like to save the console with the Certificate manager you have just made. If you do, you will be able to skip the first 9 steps next time. *) If the root certificate is available in "User account" but not in "Computer account" then "Certificate Information" will confusingly show that the personal certificate is valid. However, the personal certificate cannot be used for IPsec because IPsec only looks in "Computer account" for root certificates. You can prevent this by always including the root certificate in the PKCS#12 file. This will make sure that a valid root cert is always installed in the root cert store of "Computer account". Once you have imported the user certificate, you can configure an L2TP/IPsec connection which uses this certificate to authenticate against a Linux Openswan server. At the "Security" tab of the newly created connection, click "IPSec Settings". Deselect "Use pre-shared key for authentication". 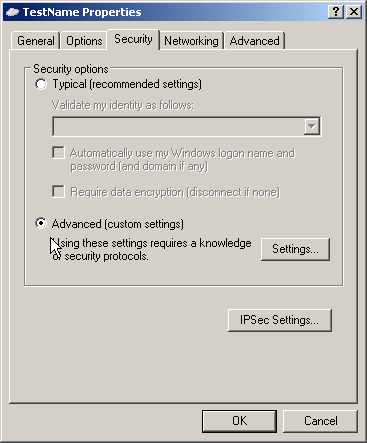 On Windows 2000 there is no "IPSec Settings" button because it does not support PSKs. Certificates will always be used. Continue with the procedure for PSKs mentioned as above and ignore the step where the "IPSec Settings" button is mentioned. You cannot select which certificate to use for a particular L2TP/IPsec connection. 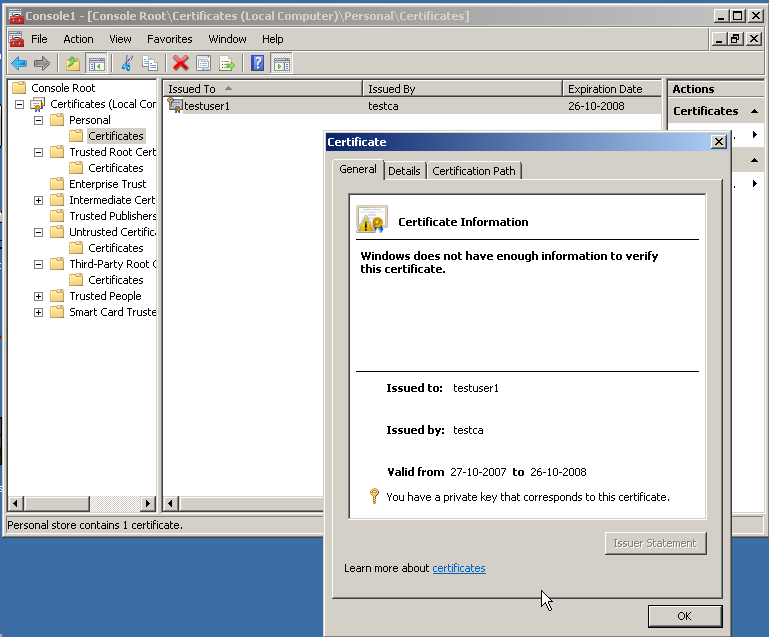 How does the Windows 2000/XP client know what certificate to use if multiple certificates have been imported? Well, the client requires the certificates on both sides to be signed by the same Certificate Authority (CA). 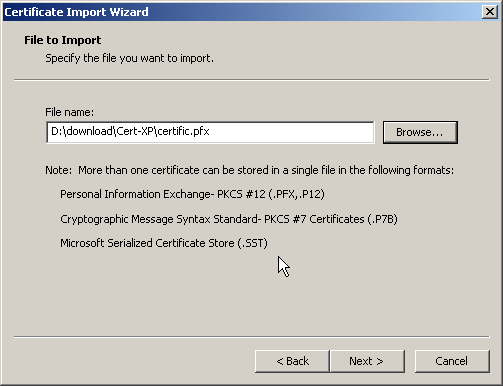 The PKCS#12 file contains the user's private key, the corresponding certificate and one or more CA certificates. The Linux server's certificate is not included in the PKCS#12 file. 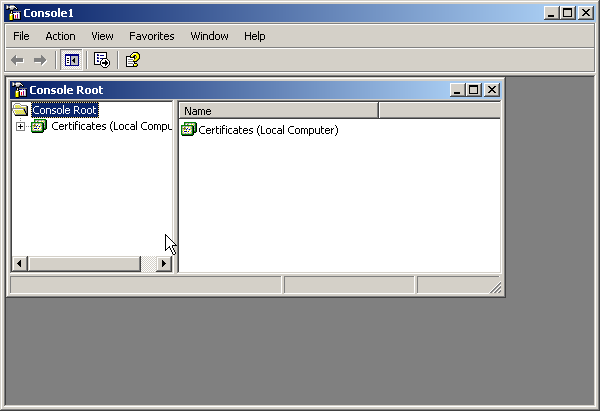 Windows 2000/XP will accept the certificate from the server itself once the IPsec negotiations start. It then verifies the validity of the server's certificates with the CA certificate it has in its certificate store. (I don't know if it checks a CRL if one is specified in the CA certificate). Windows 2000 Professional: first install ServicePack 3 or higher, otherwise the patch will not show up in WindowsUpdate. The update can then be found in the 'Recommended updates' section in WindowsUpdate. Windows XP: you can install either ServicePack 1 or ServicePack 2. The NAT-T update is included in SP2 but not in SP1. If you install SP1, you will find the NAT-T update in the 'Recommended updates' section in WindowsUpdate. Windows 2000/2003 Server: read this. More information about NAT-T in general can be found here. When ServicePack 2 has been applied to XP and the VPN server is behind a NAT device, you need to take notice of an issue discovered by George Ou. Microsoft changed the default behaviour of NAT-T in SP2 and initially did not tell anyone about it. Windows XP SP2 does not support IPsec connections to servers behind NAT. Apparently Microsoft considers this a security risk because of an (uncommon) scenario which is described here. This caused them to change the default behaviour of the L2TP/IPsec client in Windows XP with SP2. Microsoft even says that a VPN server behind NAT is "not recommended" (see also KB Q885348), although the NAT-T RFC described it as a normal setup that should be supported. The original behaviour as introduced by NAT-T update Q818043 for Windows 2000 and XP SP1 is restored by adding a special registry key ("AssumeUDPEncapsulationContextOnSendRule"). This is described in Microsoft Knowledge Base article Q885407. More information and a script for changing the registry can be found in this article by George Ou. Windows Vista requires a similar change if the server is behind NAT. You need to use Openswan 2.4.5 or higher when the Openswan server is behind NAT. More information about this here. The MSL2TP client can be hacked to enable Perfect Forward Secrecy. 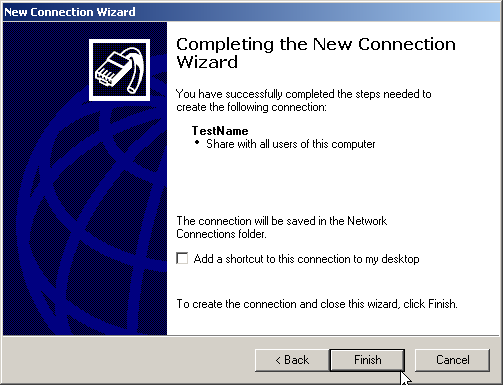 But I don't know how to do this in Windows 2000/XP, that is, when the "New Connection Wizard" is used to create an L2TP/IPsec connection. There is no "PFS" setting in the "New Connection Wizard". Perhaps the default security policy of the Wizard can be hacked so that PFS is enabled, but I haven't tried that. There are valid reasons for using PFS. If you really need it, you might have to use IPsec without L2TP (e.g. through a third-party IPsec client, the Linsys IPsec Tool (lsipsectool) or Marcus Müller's IPSEC.EXE program). Then it's possible to enable PFS. The error messages generated by Windows are often not terribly clear. I discuss some of the L2TP related messages in this section. If you get an error message not listed here or if you just want more information on why a particular connection fails, check out the IKE log and/or PPP log on Windows. 9.1 "Error 624: Cannot write the phone book file"
"Error 624: Cannot write the phone book file"
This probably means that you are modifying the settings of your L2TP/IPsec connection (e.g. you want to set the IPsec Preshared Key) while you are logged in as a user with restricted rights. This operation requires Administrator rights. 9.2 "Error 629: Disconnected by remote machine"
"Error 629: The port was disconnected by the remote machine"
9.3 "Error 678: No answer"
"Error 678: There is no answer." You will have to check the IPsec error messages on the Openswan server. It's difficult to say what could be wrong: the VPN server cannot be found, incorrect IP address, hostname does not resolve, authentication fails because of incorrect certificate or PSK, incorrect connection parameters in ipsec.conf ("but no connection has been authorized") etc. There is very little logging and error reporting on Windows client. It's probably easier to start by examining the logs on the VPN server. See also Error 792. 9.4 "Error 732: PPP not converging"
"Error 732: The PPP negotiation is not converging." This error may occur if you are using an incorrect "local ip" parameter in l2tpd.conf. It should specify an IP address on your internal (protected) network, not an external (public) IP address. See also this paragraph. 9.5 "Error 734: PPP terminated"
"Error 734: The PPP link control protocol terminated." As far as I know you can disable callback for an L2TP/IPsec connection through this procedure: open the "Networking" tab of your L2TP/IPsec connection, click the "Settings" button near "Type of VPN" and disable the LCP extensions. 9.6 "Error 737: loopback detected"
... then chances are that you are using an outdated l2tpd RPM. The problem has been resolved by Damion de Soto. My l2tpd RPMs (versions 0.69-5jdl and higher) contain Damion's patch. The other L2TP daemons may not have this problem. In fact, Ulrich Holeschak reported that rp-l2tp works fine. Dossy Shiobara also reported that rp-l2tp works. 9.7 "Error 781: no valid certificate"
"Error 781: Encryption failed because no valid certificate was found." Obviously there is something wrong with the client certificate that you imported. 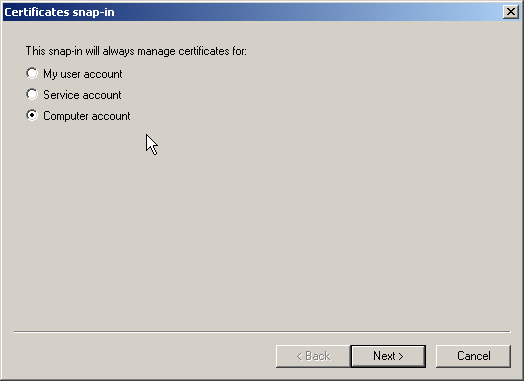 This error may occur when you use the MMC certificate snap-in to import the certificate and the snap-in was mistakenly configured for "My user account" instead of "Computer account". Or perhaps the imported certificate did not contain a private key (check the properties of the certificate in MMC: it should report that it has a corresponding private key). Remove the certificate(s) that you imported and make a new Certificate snap-in for "Computer account", following the instructions mentioned above. Then import the certificate again. Check the clocks on both the Windows client and the Linux server. Have they been set to the correct time and date? 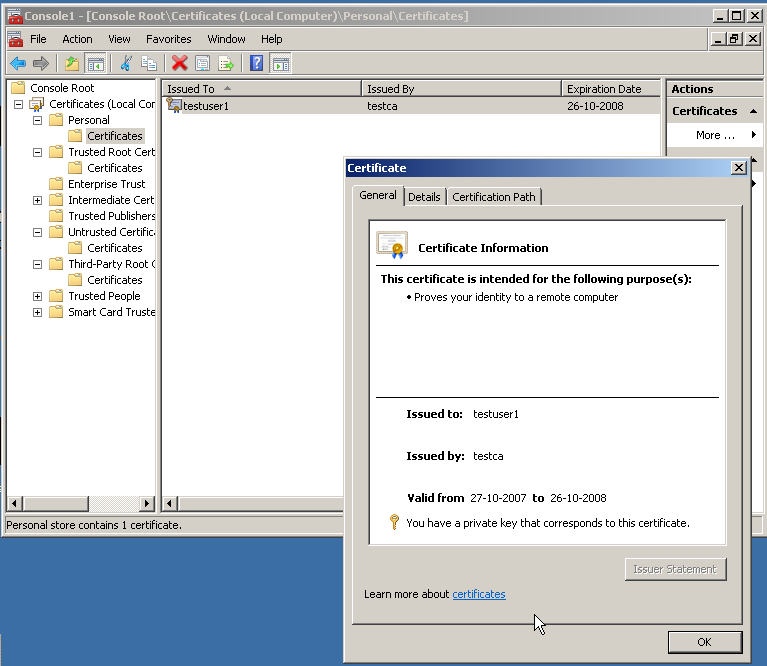 If not, the certificate may be rejected because the computer mistakingly thinks that the certificate is not yet valid or has already expired. Knowledge Base article Q247231 also mentions Error 781, but that article concerns Windows 2000 Server. 9.8 "Error 786: no valid machine certificate"
"Error 786: The L2TP connection attempt failed because there is no valid machine certificate on your computer for security authentication." See the remarks under Error 781. These two error messages appear to be telling the same thing but I don't know exactly the difference between them. 9.9 "Error 789 encountered processing error"
"Error 789: The L2TP connection attempt failed because the security layer encountered a processing error during initial negotiations with the remote computer." The certificate (plus private key) has not been installed correctly. Windows 2000/XP's built-in IPsec stack has been disabled, e.g. when a third-party IPsec client (e.g. SoftRemote or SSH Sentinel) was installed and then removed. You are connected to a Windows 2000 Server through a Terminal Server (RDP) session. On that Windows 2000 Server you have configured a VPN connection to an L2TP/IPsec server. You attempt to bring up this connection but you get the Error 789 (see also MS KB Q326751). The remote VPN server is rejecting the IPsec connection because the configuration of the client and the server do not match ("no connection has been authorized"). In the first case, try to import the certificate again following the instructions. Verify in MMC that certificates actually have been installed for both the CA and for the user, including the private key. When you view the details of your certificate, you should see the message "This certificate has a corresponding private key". When MMC asks where you want to store the certificate, be sure to select "Local Computer", and not "My user account". Verify that the certificates are valid, not expired (check the start and end dates) and issued by the exact same CA as used on your Openswan box. Any (chained) root certificates should also be valid. Check the internal clock of your computer: if it is set to a strange date (say, 1970 or so), your computer will think that the certificate is not (yet) valid. In the second case, you can re-enable the Windows IPsec service as follows. Click Start -> Programs -> Administrative Tools -> Services. Select "IPSec Policy Agent" from the list and check if the Startup type is set to "Automatic". If it is not, this is the problem. Set Startup type to "Automatic", click Apply and then Start. Microsoft's error message is misleading. The user may easily get the impression that the Linux server is at fault. However, the error pops up immediately after clicking "Dial". I also sniffed the network communication between the client and the server: there was no network traffic. If there are no packets exchanged between Windows 2000/XP and the Linux server then it is impossible that the server is to blame. It seems to me that other error messages would have been more appropriate, for instance the error 781 mentioned above. Removing SSH Sentinel is described here (unfortunately these instructions have not been updated for version 1.4 but you'll get the idea). The third case is a bit atypical and I am only mentioning it for the sake of completeness. Q326751 says this is a known problem in Windows 2000 Server. According to Oleksander Darchuk the problem does not occur if you use VNC or any other remote administration tool, as long as it is not RDP. Alternatively, you could make a VPN connection from the client itself, bypasssing Windows 2000 Server. Or perhaps the problem has been fixed in Windows 2003. Either way, the L2TP/IPsec VPN server is not to blame. 9.10 "Error 792: Time out"
"Error 792: The L2TP connection attempt failed because security negotiation timed out." The client did not hear anything back from the server. A lot of things can cause this. The IP address or hostname of the VPN server could be incorrectly entered. Openswan could not be running. The L2TP daemon could not be running. A firewall could be blocking packets (or packet fragments). The client could be using a preshared key instead of a certificate or vice versa. Etc. etc. Can you ping the VPN server? If that does not work, it could indicate a problem with reaching the client (although some VPN servers are blocking ICMP echo packets which is a bit silly if you ask me). Also, check the logs on the VPN server and on the Windows client. "only OAKLEY_GROUP_MODP1024 and OAKLEY_GROUP_MODP1536 supported. Attribute OAKLEY_GROUP_DESCRIPTION"
This is just a harmless message and not an error. You probably installed the IPsec update for Windows 2000/XP or XP ServicePack 2. These contain support for Diffie-Hellman MODP2048 (group 14) which is not supported by your version of Openswan. Both sides will agree upon either MODP1024 (group 2) or MODP1536 (group 5). Nothing to worry about. Some people reported the following problem. They have a Windows 2000 or XP client that should connect to 2 or more Openswan L2TP/IPsec servers that each have their own CA. Different certificates were installed on the client. But when the client connects to a server, it always presents the same certificate to the server. So the client can connect correctly to one server but not to the other VPN server(s). This is not what you want. The client should be able to connect to all servers. Quick solution: add rightca=%same to your configuration. The long story is as follows. The messages exchanged in an L2TP/IPsec authentication are described in this Microsoft 'Cable Guy' article (see table 4). The server sends a 'Certificate Request' (CR) payload in Main Mode message 4. This is basically a string of characters containing the name of the CA that issued the server's certificate. I suspect that the problem mentioned above occurs when the server does not send this CR payload. 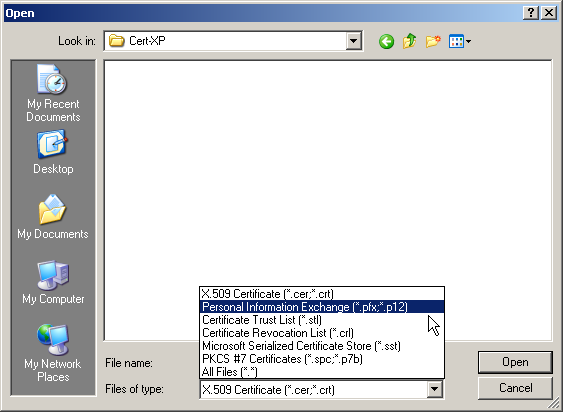 Then Windows 2000/XP just seems to pick the first certificate that it can find in its certificate store. Windows' IPsec implementation requires that both the client and server certificates were issued by the same CA. The X.509 support in Openswan is much more flexible (see Strongsec's documentation). But in some cases this flexibility leads to a misconfiguration so that Openswan does not know which CA to request in the CR payload. There are several methods to solve this misconfiguration. Another option is to specify these 3 parameters explicitly without using rightcert. In this case, Openswan will simply extract the name of the CA that issued the server's certificate (as specified in leftcert=/etc/ipsec.d/localCERT.pem) and expect the client to use the same CA. It may not not be very obvious in the Windows 2000/XP L2TP/IPsec client but there are two phases: the IPsec phase and the L2TP/PPP phase. Each phase has its own logs. Alternatively, you could use Windows 2000 Professional's Network Monitor to examine the communication between the client and the server. Windows XP does not ship with Network Monitor but you can install the Network Monitor Driver and then use Netcap to write the communication to a file. This file can be examined with Network Monitor on a Windows 2000 machine or programs such as Ethereal. Information about troubleshooting on the Linux side can be found on my main L2TP/IPsec page. After you enable PPP logging, you obtain a file called PPP.LOG. The PPP.LOG is not always useful because many details are logged as a hexdump. Microsoft has released a hotfix that corrects the behavior of the IPSec Policy Agent. After you apply this hotfix, the RPC-based interfaces return the correct status code that other Windows components require. That is not much information. I found out that it also slightly changes the IPsec proposal that a Windows Server 2003 sends (when used as a client). Before applying the hotfix Windows 2003 sends OAKLEY_GROUP_MODP2048 and afterwards it proposes OAKLEY_GROUP_MODP1024, which is a lower encryption strength. Not a big deal, and they have probably done this to increase compatibility with non-Windows clients, but what else has changed in this hotfix that Microsoft does not talk about? Microsoft sometimes fixes security vulnerabilities through hotfixes without telling anyone, so could this hotfix plug some holes that we don't know about? certimport by Xelerance (the company that does Openswan development and consulting). Certimport is based on pfxMachineImport by Keith Brown (see below). This is a free command line executable that can install a certificate from a PKCS#12 file without user interaction. Simply extract the executable from the zipfile and run "certimport.exe -p thepassword certicate.pfx" where 'thepassword' refers to the password used to protect the PKCS#12 file. pfxMachineImport (local copy) by Keith Brown. Imports a PKCS#12 file automatically without user intervention. Another stand-alone certificate installer is available from Smoothwall (commercial product). 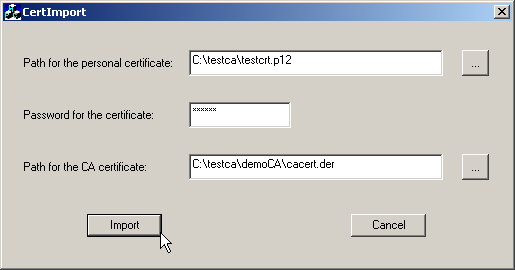 CertImport: a Visual C++ project written by Kiko Vives Aragonés to import CA and personal certificates from files. 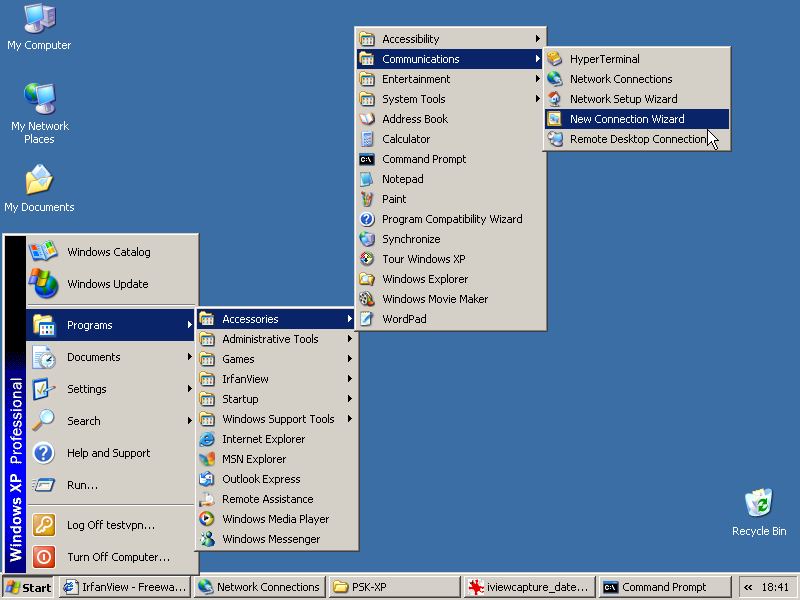 Unlike the two programs above, it contains a GUI. The certutil tools included with Microsoft's Windows Server 2003 Service Pack 1 Administration Tools Pack ("Adminpak"), which can be used on Windows 2000/XP clients despite the Adminpak name. A number of VBS scripts written by Alex Ferrara of ReceptiveIT. One of the included scripts uses MMC to import a certificate by automating keyboard shortcuts. (Note: keyboard shortcuts may need to be modified on non-English versions of Windows). All programs mentioned above require Administrator privileges to import the certificate. 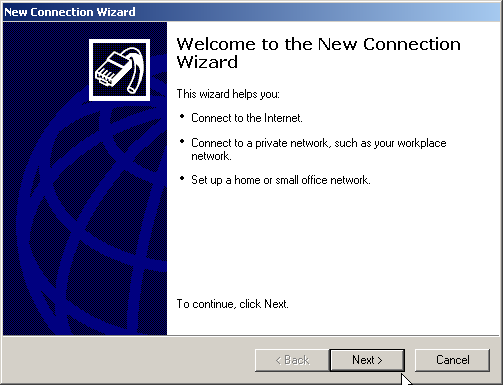 The VPN New Connection Wizard: this is the fairly user friendly wizard that can create PPTP and L2TP/IPsec VPNs if you click on "New Connection" in Dial-Up Networking. As far as I know, it cannot be automated. The solution that Microsoft itself recommends for automated setup is the Connection Manager Administration Kit (CMAK) which is included with Windows 2000/2003. A CMAK example can be found here. The CMAK creates a executable which can then be handed out to the user by the system administrator. This executable automatically configures the VPN connection on the user's computer. Not surprisingly, only Windows 2000/2003 Server can generate these executables which means it does not make (financial) sense to use CMAK with Openswan. One of the VBS scripts written by Alex Ferrara automates the VPN New Connection Wizard by automating keyboard shortcuts. The Microsoft Management Console (MMC). This is a horribly complex GUI if you use it to create IPsec policies manually. (Here should be a link to the poor sap who actually put online a description of the procedure). The ipseccmd.exe (Windows XP) and ipsecpol.exe (Windows 2000) command line utilities. Linsys IPsec Tool (lsipsectool): a small tool/utility by Enrique E. Martinez Cardenas to configure, establish and monitor IPsec profiles in Windows 2000/XP. Uses Wxwidgets and IPsec2k library. It uses the IPsec implementation included with Windows. The Shrew Software VPN Client (freeware). It has been tested with ipsec-tools but it works with Openswan / Strongswan too. Marcus Muller's IPSEC.EXE. This utility was one of the first to be used by Openswan users but currently the Linsys tool is to be preferred. IPSEC.EXE's configuration file uses the same syntax as Openswan's. TauVPN / iVPN by Nejc Skoberne and Stefan Markowitz. Alex Pankratov's IPsec2k library. This is a home-brew API library for configuring the IPsec Policy Agent in Windows. Securepoint Personal Firewall & VPN Client: free. Also contains a firewall. The remainder of this section discusses methods that have not actually been tested. If you know whether they work and/or any other good solutions, let me know. There is a filed called rasphone.pbk located in %SystemDrive%\Documents and Settings\%Username%\Application Data\Microsoft\Network\Connections\PBK\ which appears to contain the configuration generated by the New Connection Wizard. This is a text file in the well-known .ini format. Perhaps appending an entry for a new L2TP/IPsec connection actually works. A problem may be adding the username, password, domain name and PSK because these are not included in the rasphone.pbk file. The use of "connectiods" (setup files with the extension .ins)". But these connectiods are are probably too limited, since they are mainly used by ISPs to automate creating Internet connections. The use of one of the previously mentioned utilities in combination with installers such as InstallShield or Wise. There are also free installers such as Nullsoft Installer and Inno Setup. Automate the VPN New Connection Wizard using VBScript or some other method. The Windows VPN creation API is undocumented but somehow Google made a VPN client that creates PPTP connections automatically. Google is no friend of Microsoft's so how did they managed to do this? Presumably the same method can be used for L2TP/IPsec as well. The use of an input recorder' that records key presses and mouse clicks and replays them to create a VPN connectiod and/or MMC configuration. Microsoft Knowledge Base: description of the IPSec Policy Created for L2TP/IPSec. If you don't want to send regular Internet traffic through the VPN tunnel you may want to enable split tunnelling. See this section for more details about split tunnelling and its advantages and disadvantages. 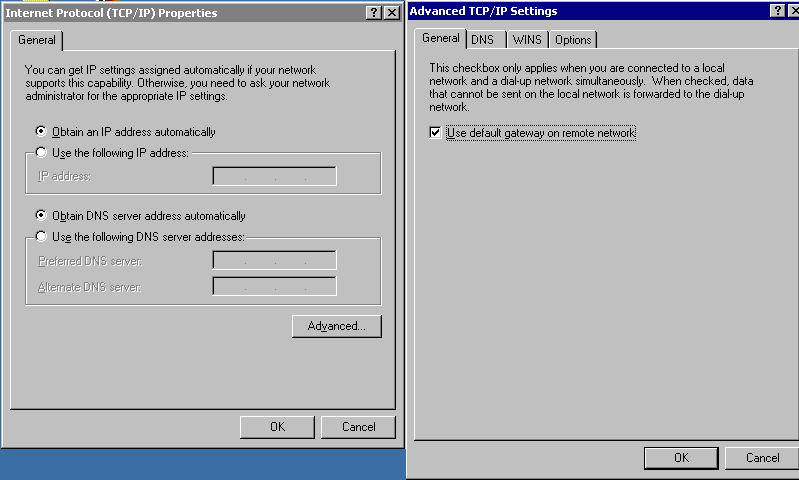 On Windows 2000/XP, you enable or disable split tunnelling by modifying the 'Advanced' TCP/IP settings of the VPN connection you created. You have to uncheck the box called "Use default gateway on remote network" to enable split tunnelling. Jan 7, 2006: pfxMachineImport no longer on original website. Copy available here. Jun 24, 2005: Added reference to lsipsectool. 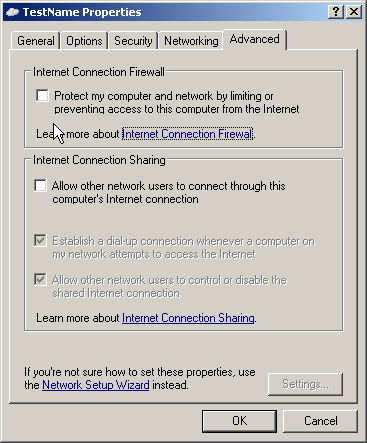 Jun 14, 2005: Added reference to the Securepoint Personal Firewall & VPN Client. Mar 17, 2005: NAT-OA bug in Openswan when the server is behind NAT. Dec 5, 2004: XP SP2 may require a registry modification when the server is behind NAT. Sep 8, 2004: Added OAKLEY_GROUPS warning. Jun 11, 2004: Added error 732. Jun 3, 2004: Added error 734 after sifting through a PPP.LOG. Jan 4, 2004: Added error 781 text (thanks, Skip!). Aug 12, 2003: NAT-T update re-released. Mar 31, 2003: Updated IPsec clients by Microsoft released for Windows 2000/XP. Mar 14, 2003: Extended text on error 789. Mar 8, 2003: Better info about "IPSec Settings" button. Feb 27, 2003: Windows 2000 Professional does work! Added remark on storing certificate on token. 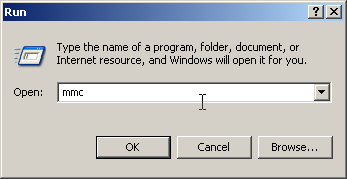 Jan 17, 2003: Windows 2000 Professional does not work. Dec 21, 2002: Forgot to link to screenshot #11. 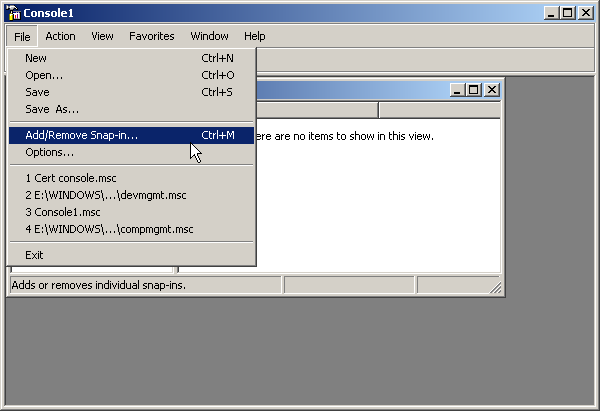 Dec 19, 2002: Added Windows 2000 logfile snippet. Dec 14, 2002: Page created.